Often overlooked due to all the frozen ones available -or due to the pizza guy – but homemade Pizza should be on the list much more often. Not only is it quick and easy to do and to pre-prepare, no it is one of the rare dishes where actually everybody could make it to their own liking – or to empty the fridge with all the leftovers you might have. And it goes without saying that it is a fun meal to prepare with the kids – they love to toss all the ingredients and to prepare their own dinner! The recipe I use is for flat pizza’s, no yeast. I usually double the below amount to prepare one baking tray. Mix all the ingredients together in a bowl, use your hands, it is easiest and you get a better feel for the consistency. The dough should not be sticky but not too dry either. Spread it by hand or use a rolling pin (the dough should not stick to it). Or make several flat pieces and the kids can prepare their own pizzas. The dough should be thin, about 0.5cm. Place it on baking paper and onto the baking tray. Now the fun part – the toppings. I tend to do be in a hurry when making the pizza so I use a tin of crushed tomatoes and mix it up with some tomato paste, grounded pepper, and fresh herbs for the base. – or even just plain with tomato sauce and shredded cheese. 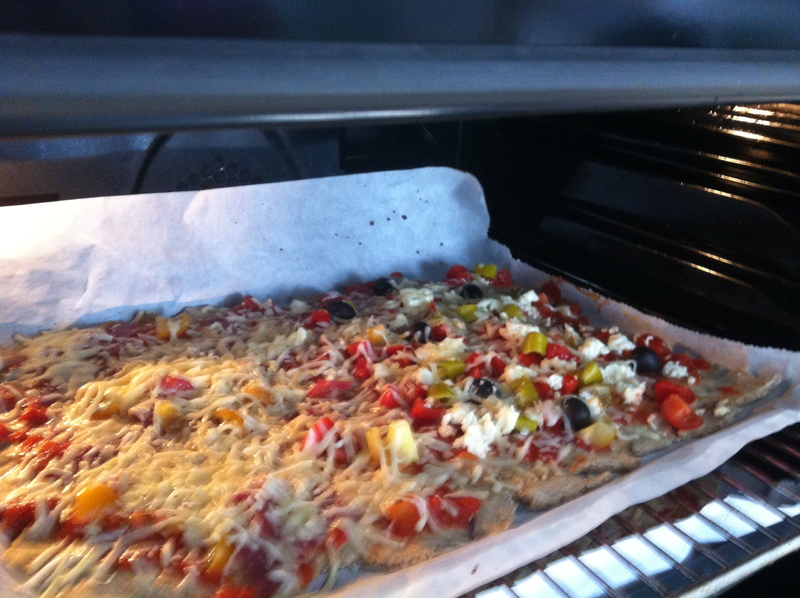 Bake in the oven at 220deg C. Until the cheese is melted and the sides of the dough are slightly brown (10-15 min).